What are the best FileZilla alternatives / best free FTP client like FileZilla? Or, Which are the best free alternatives to Filezilla FTP Client to transfer files? Which are the best free alternatives to Filezilla FTP Client to transfer files? FileZilla is one of the most powerful and best free FTP solutions which you can use to upload files to your web server. This FTP client open source software distributed free of charge under the terms of the GNU General Public License. The software can be downloaded for free from its official website and can be used both for home and office tasks. Learn more here: What is FTP, and how do I use it to transfer files? In spite of all these awesome features of FileZilla FTP client, we have received many requests on our website where our readers are asking about some best FileZilla alternatives as they want to try something different. There are many FileZilla alternatives which you can use and upload the files on your online servers. We did a little research and compiled the best FileZilla alternatives (free and paid). In today’s software guide, we are going to share a complete list of top 12 best alternatives to Filezilla FTP client. Certainly, FileZilla Client is one of the most popular and reliable cross-platform FTP (file transfer protocol), FTPS and SFTP client with countless of advantageous features and an intuitive graphical user interface. But if you are a newbie and want to use only a few basic FTP functions then using FileZilla can be a bit intimidating thing for you. If you are using Windows operating system and are looking for a powerful FileZilla alternative then you should try WinSCP free FTP client. The software can be downloaded for free and comes with a user-friendly interface. The file manager will allow you to easily upload all the files on the online web-server. The Secure Shell will help you in securing all the transfers. Cyberduck is one of the best alternatives to Filezilla which you can use both on Windows and Mac operating systems. There are a lot of amazing features available in this software. Just like WinSCP and Filezilla FTP client, Cyberduck is also available for free. Some of the formats which are supported by this software are SFTP, FTP, Cloud Files, Amazon S3 and WebDAV. CuteFTP can be considered as a clone of Filezilla FTP client which we use daily for exchanging of files. Support of standard FTP over SSL (FTPS) and SFTP (SSH2), Transfer Resume, Scheduled Transfers, Concurrent Transfers, Multi-part Transfers, Site-to-Site Transfers (FXP), Filtered Listings, and Synchronize Folders etc. are some of the most valuable features of CuteFTP FTP program. The software is developed by Global Scape and can be used both on Mac and Windows operating systems. You can easily download this simple and secure FTP software from the CuteFTP official site. Forklift is an advanced file manager and FTP + SFTP + Amazon S3 + WEBDav client for Mac OS X users. You get a dual pane manager in this software which means you can use this software both as an FTP and SFTP client. Forklift comes with amazing design and amazing features and is one of the best alternatives to Filezilla. Along with FTP and SFTP, Forklift also supports iDisk, NIS, AFP, Amazon S3 and WebDAV. SmartFTP is a professional FTP client which is available only for Windows devices. The latest update of the software makes it compatible with Windows 10 too. You can not only upload and download data but also use SmartFTP for creating backups of your server. FTP and FTPS (Secure FTP), SFTP over SSH, Integrated Editor, Modern Graphical User Interface (GUI), File/Folder Synchronization, Multilingual (more than 20 languages), Thumbnails View and Preview, Visual Compare, Advanced Schedule, UTF-8 Support, Multiple Connections, Autos reconnect and resume of broken transfers, Transfer Integrity, Remote Edit of files, Search for files and folders on the server, Enhanced NAT/UPnP Support, Transfer Queue, and Proxy / Firewall support etc. some great features of this FTP client. Transmit is also a well known FileZilla alternative which is only available for Mac users. This is a paid FTP software. However, you get a 7-day free trial period which will allow you to check all the exclusive features which come with Transmit FTP client app. Learn: How to Extend Trial Period of Any Software? If you are using Mozilla Firefox web browser then you can simply install an add-on on it called FireFTP free secure cross-platform FTP/SFTP client which will work as your online Filezilla alternative. You don’t have to install a special software. Just install the add-on on Firefox and you are ready to use FireFTP. If you want to use a secure, reliable alternative to Filezilla which comes with a simple Graphical user interface then you need to try FlashFXP FTP Client Software. You can perform both the client to server and server to server operations using FlashFXP. Uploading, downloading, and synchronizing files are super easy with this helpful FTP client. If you want to upload data on your online cloud accounts like Sky Drive, Google Drive, Box or others then you should use CarotDAV. CarotDAV comes with a user-friendly interface which will allow you to download and upload all the files easily. Free FTP is one of the best alternatives to Filezilla FTP client. The FTP client is developed by CoffeeCup software. This is a freemium tool as you can try both the free and premium versions of this tool. All the basic operations which are required in an FTP client are available in free version. With the help of Free FTP, uploading and downloading files and folders is super easy. Also, setting permissions for files and folders on your server is just a click away. 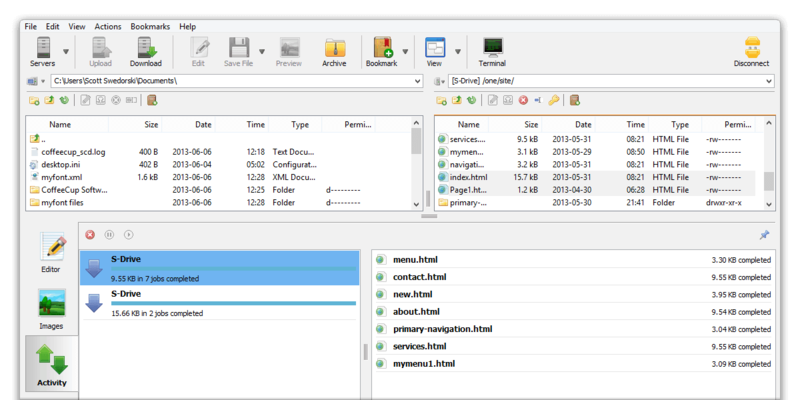 this Filezilla alternative is really fast, easy and intuitive. support for secure file transfers, including SFTP over SSH, FTPS over TLS, and HTTPS. FOFF or Free Open FTP Face works on Windows and Linux operating systems. FOFF has a simple user interface. If you are a newbie and want an alternative to Filezilla you need to try this software as it comes with a limited set of features. We have shared many different FileZilla FTP client alternatives. We will end our list with AndFTP which is an android FTP client. FTPS, FTP, SFTP, and SCP are some of the protocols which are supported by this client. You can manage your server and your website easily using this software. The software is available for free. AndFTP offers download, upload, synchronization and share features with resume support. It comes with both device and FTP file browser and can manage several FTP configurations. So, these are top 12 best alternatives to FileZilla FTP Client which you can use to transfer your files in any way. 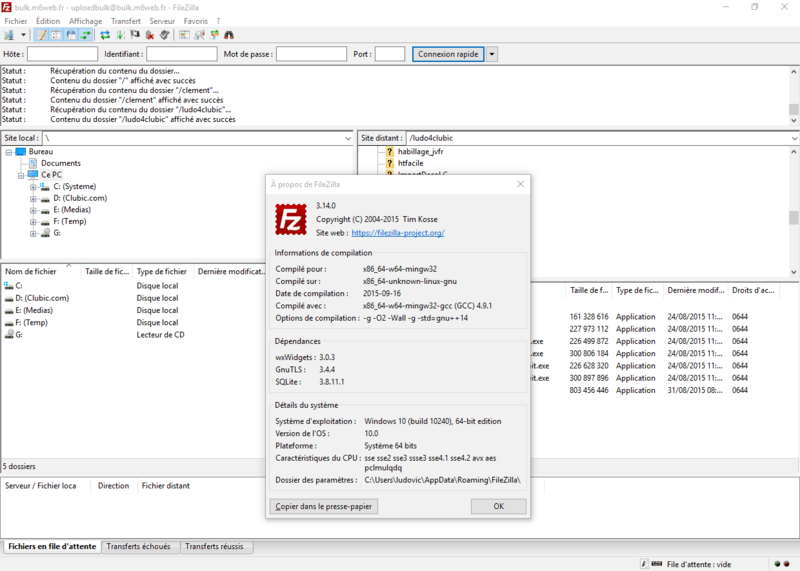 If you are not happy with the interface of Filezilla FTP software then you can try these FileZilla FTP client alternatives. Let us know using the comments section below – Which free FTP client are you using instead of Filezilla FTP client? What are your favorite alternatives to Filezilla from the above-given list of top 12 best FileZilla alternatives (free and paid)? WebDrive should be on this list. Haven’t even heard of half of these clients. Not free but much more secure than any of the free clients listed and frankly, the only one I would trust. “Webdrive” by southrivertech. Good ftp clients mentioned by you. I love fireftp & filezilla. Thanks for this list for alternatives.